My father once ran out of a restaurant because people at his table talked religion. He hated offending people and nursed a strong distaste for “holy rollers.” I like talking religion. I’m curious about the meaning of life. If you study American history you can’t help but bump up against Christianity. Christ has always been controversial and in the 19th century it was no different. Don’t be scared of Ellen White. Yes, her nose is disfigured. A mean boy threw a rock in her face as a child landing her in a coma. When she awoke with a screwed up nose she was devastated. A few years later she had a conversion experience. Eventually she had controversial visions of the great spiritual war going on behind the veil of what we call normal life. Fallen angels and followers of God fought for the souls of mere mortals. Ellen wrote about everything from vegetarianism to education and evangelism. Good discussion Yes. Fight yes but at work not socially. I used to study the many different religions, from Hindu to Jehovah Witness. I avoid talking about it though. People are usually invested in their own beliefs to have an intelligent conversation about the varied faiths. I’m lucky to have friends who are respectful and can handle debate. I used to work for a man who hated Christians of any kind. It colored his thinking about people so much that he lost a lot of allies and friends. It was sad. Amazing woman. I can’t believe I’ve never heard of her. I can’t imagine having the time to write so much! Yes she was an amazing and gifted women, whatever happened, what was the outcome of the project of October 2009? I’d love to know! After all its now 2016!!! Oh boy! Just discovered your comment from a year ago sitting in spam! Sorry I’m so awful at wordpress! 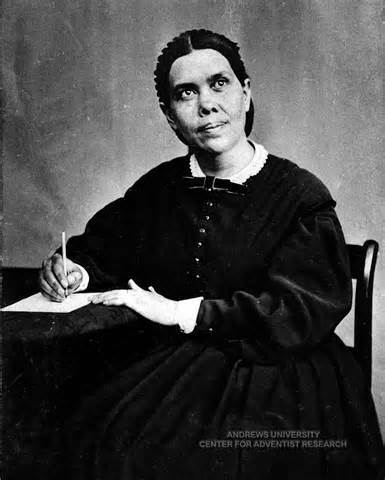 The fact is that Ellen G White was a plagiarist and had others write most of her literature. Coming from a religious perspective she was a cultic leader who started the seventh day Adventist church. Hmm. Did not know that. i’m not a Seventh Day Adventist. I was kind of interested in them because they talked about the importance of the Sabbath but their way of looking at it didn’t really fit with the way the Jewish figured out the Sabbath. Also had trouble with the idea that she was a prophet. With sufficient research on your part you’ll be able to find that both accusations are found and proven false. How would she know that over 130 years later the doctors would be saying the same thing. How would she know if she plagiarised if this would indeed happen? I really appreciate your comments and questions. You bring up good points. My only question still comes back to the Sabbath. the Jews didn’t go by the Roman calendar so I heard they went by the lunar calendar to calculate when the sabbaths were. I have no agenda here. I enjoyed reading some of her writings from The Great Controversy. As a homesteader I totally get the idea of vegetarian diet but I found I was weak when I was on it. The soil in this part of the US is definitely deficient in minerals so we have to supplement our sheep. It is interesting how much White got right. I was surprised at how compassionate and tolerant she was. Adrienne, thank you for the post. Isn’t the world just filled with interesting people, interesting stories? How can you not love people who are powerfully motivated by their spirit and good intentions? How can people ever be bored?! Thanks for stopping by, David. I am actually seventh day Adventist myself, and contradicting what people may think, we (seventh-day Adventists) do not think of her as a prophet. In fact, she says her self that here is a prophet. Instead, we believe that she was inspired by God, and had visions inspired by God. Her writings are very good, and we (SDAs) use here writings as material alongside the bible. We do not view her writings as higher than the bible in any way. Everything she writes supports the bible and explains it. Good interesting article! Interesting explanation! I think I’ll spend a little more time exploring her works. I’ve been fascinated by SDA’s for a while now. My only question is about the accurate time for the sabbath. From my understanding the Jews went by a different calendar so the sabbaths fell on different days of the week. Why do the SDA’s say that Saturday is the sabbath? Hi Adrienne, I stumbled across your post and found it refreshingly concise. 🙂 I’m also Seventh-day Adventist and I’m curious what you mean by accurate time for the Sabbath? The Jews had yearly festivals/ceremonies which in the Bible are also called ‘sabbaths’ which fell on various days of the week, but through the ages have continued to observe the 7th day of the week as their weekly Sabbath. Adventists believe that there’s no biblical evidence that the weekly Sabbath has changed (in the expectation to keep the commandment or in day of the week–e.g. to Sunday). I wouldn’t say we keep the Sabbath the same way as the Jews, however, since in Jesus’ life and teachings He clarified the true meaning and spirit of Sabbathkeeping. Does that make sense? I find this all so interesting. I wonder if we’re only talking about the spirit of the sabbath then why does it matter which day of the week it falls on? We used to watch Walter Veith’s documentaries and found them intriguing (actually we spent an entire winter watching him lol). But then I stumbled upon something about Jewish sabbaths falling on all different days of the week. I didn’t know what to believe. So is Ellen considered a prophet? My husband and I wondered about the vegetarian aspect as well since in the Bible milk, honey, lamb etc are all good things. As I have read your comments and others, I thought I would share my experience. I am still a young man at 23, but I started reading Ellen White’s books when I was 14. I heard about some of her books, and I was very interested. So, I started reading ones that stuck out to me, like the Desire of Ages (a beautiful book on the life of Jesus), Steps to Christ and the Great Controversy. I was brought to tears. Hearing of the love of Jesus in her writings, reading alongside my Bible was such a blessing to me. Reading topics like money management, family, and other topics radically transformed me too. The new man I was becoming became unrecognizable compared to my old self. I give all the credit to God for that, but He used these books to be a blessing to me. I think that the most important question for you is not, “Does the Seventh-day Adventist church consider Ellen White a prophet”, although if you look on the church’s website, it definitely does in the statement given by the church. I think that the most important question for you is, “was she really a prophet?” What men say does not matter; it is what God says that matters. Jesus first asked the question, “who do men say that I, the Son of man am?” He then followed that question by asking, “but who do you say that I am?”. We won’t be judged according to the standard that men say, but according the standard that God said in His word and the evidence that was given. I would recommend to you that you just read one of her books for yourself. Compare it with the Bible. “To the law and to the testimony, if they speak not according to this word, it is because their is no light in them” Isaiah 8:20. If what you find contradicts the Bible after careful study, you know that she is not a prophet. But if what she says is in harmony with the Bible, then there would be opportunity for further study. Read Matthew 24. Jesus warned against false prophets repeatedly, so we can’t be too careful. But if there is a false, there is also a true. He didn’t say that there wouldn’t be any prophets in the last days. Try reading a book like the ones I mentioned above or Patriarchs and Prophets, Prophets and Kings, or Acts of the Apostles. If you want to know more about what she wrote on health, you can read the Ministry of Healing. All of these books are available on audiobook for free at audioverse.org under the “books” tab. You can also order the physical copies or find the ebooks online for free. Concerning being vegetarian, my sisters convinced me to become vegan 9 years ago. I felt so great, I didn’t want to go back! There’s a lot to that question. We know that God did give men permission to eat meat of clean animals after the flood, giving the stipulations there and other places that it was not to have the blood or fat in it (Genesis 9). But in the garden of Eden they didn’t eat animal products. When God brought the children of Israel out of Egypt, he put them on a plant-based diet, manna, for 40 years. During that time they craved meat, and God sent a bunch of quail because of their complaining and they vomited it out (Numbers 11 etc.) The manna was all they needed, but they wanted more. When Daniel and his friends requested that they not eat the Babylonian kings unhealthy and intoxicating food, they ate plant-based and were found much more healthy than everyone else after a 10 day test (Daniel 1). In heaven we won’t be eating meat, so if we are preparing to go there, why not start now? Concerning honey, Ellen White did not discourage it’s use, and neither does the Bible. But the Bible does say not to eat too much honey! She also did not condemn the use of milk, but said that closer to Jesus’ second coming, they would become more unsafe. Notice this quote, “The diet reform should be progressive. As disease in animals increases, the use of milk and eggs will become more and more unsafe. An effort should be made to supply their place with other things that are healthful and inexpensive” Ministry of Healing Pg 320 paragraph 2. She wrote that more than 100 years ago. Is that what we see in our world today in the meat and dairy industry? Hormones, bad diets, bad environments, eating GMO food- these aren’t things hidden in the dark nowadays. This is how I like to think about it and I think it will resonate with you. Your a writter. What do you like to use best, primary sources in your writings or secondary sources. Of course, if you can find it, you like to have it as direct as possible, right? That’s what I like too in life. So in the same way, why not eat the plants that the animals consume to get big and strong, instead of eating the animals and getting all their toxins? Hope this helps my sister! Sorry it took so long for this reply but I was thinking about it. 🙂 I just bought The Great Controversy and Ministry of Healing about White’s take on healing through lifestyle choices. I was surprised at how non-dogmatic she is about diet, etc.. Very refreshing. I may pepper you with more questions as I go! This woman was obvi Divinely enlightened! I have read a fraction of her work and she is amazing. I’m definitely intrigued by her. I read The Great Controversy and her book about diet and how she said that the food supply would be more and more corrupted and that seems pretty true to me.